When this reviewer last visited with the Second Doctor, Patrick Troughton, it was the beginning of Season 5 in September of 1967 for the 37th story - The Tomb of the Cybermen. The Doctor was just coming into his own with the character. After a couple run-ins with the Daleks previously, he faced the other of the supervillians of the Doctor Who Universe in the Cybermen. He was accompanied by his companions Jamie (who had been with him almost from the beginning) and a recently acquired, Victoria. I claim that this storyline was a huge boost to the franchise and laid a blueprint for how to tell action packed stories with this clever Doctor. 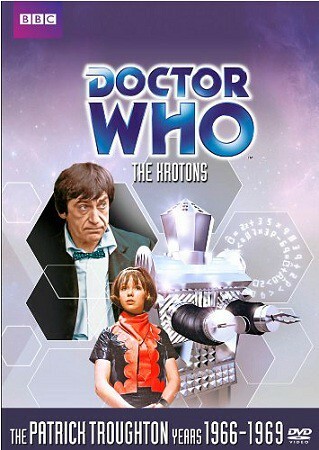 BBC has now released on DVD - Doctor Who - The Krotons. The episodes are now fifteen months after the brilliance of the Cybermen story, airing December 1968 through January 1969, and this is the 47th story of the series. A few things have changed over the preceding year and change of stories. There are still two companions, but Victoria has been replaced by Zoe. Jamie is still the main companion and he's become Watson to Troughton's Sherlock or Robin to the Doctor's Batman. It's such a comfortable releationship that once again sets a blueprint for future Doctors to try to recreate. The story of the four-episode series is basically the story of many of the Troughton episodes I've seen. I'm not sure if it's just him or if it's a sign of the rebellious nature of the late 1960s. The TARDIS lands on the planet of the Gonds (unnamed and not specifically located for us on any star map) and we meet the downtrodden Gond society. They have been dominated by an invading force called The Krotons. Our heroes meet up with the one person trying to rebel against the Krotons. Jamie gets caught and suffers torture while the Doctor and Zoe are trapped away from him. The Doctor is using his intelligence and knowledge to help the rebellion, and Zoe is just looking for a way out of their predicament. In the end, the Doctor finds a way to save Jamie and destroy the enemy and free the natives of the planet. This may sound like too basic a description of events of four TV episodes over two hours but it's the essential structure of many of the Troughton stories I've seen. I just finished watching his earlier story The Macra Terror and subsitute Macra for Krotons and the story was not dissimilar. Does this make them bad? No, not in the least. Watch a procedural show today like C.S.I. or NCIS and you'll find that same comforting ebb and flow to each episode. I like the Krotons. They are somewhat of a cross between the Daleks and the Cybermen. They have a bit of Lost In Space robot feel to their design but more practical. The Kroton is a crystal base mixed with a robotic computer to the best of my knowledge. They didn't catch on like some of the other monsters of the week but they are memorable. The "cliffhangers" to each episode also begin to follow a predictable pattern - Ep. 1: the reveal of the Krotons to the audience as an arm reaches out to the Doctor. Ep. 2: Jamie's life is in danger as we fade out. Ep. 3: another disaster seems to endanger Jamie's life. Ep. 4 ends with things all bright on the home planet and the TARDIS dematerializing until our next story. It's not too different than the commercial break pattern of a typical Star Trek episode. The DVD release includes commentary from some of the Gonds, make-up and costume designers, and a floor manager. It's not the most dynamic but for serious fans it's probably a must listen. What I liked most was the long documentary called "Second Time Around" about the great run that Patrick Troughton had on the series. You get a good idea of how the series was evolving with the times and finding a way to tell interesting stories on limited budgets. There's also an extended interview with Frazier Hines (Jamie) that looks to be continued on a future release. This is a great addition to the BBC releases of Doctor Who. It holds interest as a complete story that doesn't require knowledge of previous episodes to enjoy. The Krotons story is illustrative of what had happened with the Doctor since the Cybermen series. The Doctor is at his best as a detective. He's more mysterious than Hartnell and only slightly less playful than the future Doctors will be. Even the casual fan of the series can find interest here to see influence these stories have had on the current group over 40 years later.